Steel tubing is becoming more and more popular in the automotive world, providing high levels of durability and performance in a variety of applications. However, it can be difficult to work with, and many people resort to buying pre bent tubing for their specific needs. There is no need to spend a fortune on parts, however, when you can use our high-quality exhaust pipe benders to get the job done yourself. 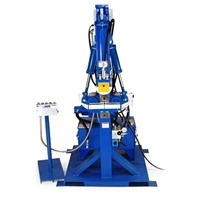 We have a variety of equipment that will enable you to handle any amount of bending you need on a daily basis, saving you time and money in the long run. Exhaust pipe benders are some of the most useful pieces of equipment your garage can own. With these parts being so important to daily mechanical work, many brands have dedicated their time to developing high-quality equipment that will get the job done. 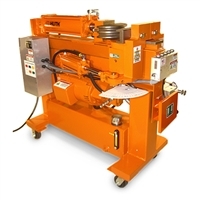 The world renowned manufacturer Bendpak created their legacy on these great machines, and we have other top names as well, including Huth, Jet Tools, and Ben Pearson so that you can find the right fit for your shop. We have many options to help you find the perfect exhaust pipe bender for your needs. 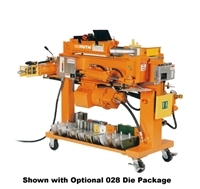 If you work in a fast paced shop that constantly needs to move a line of vehicles in and out every day, check out models with twist-lock tooling and quick-change bending dies, features that are quickly becoming standard throughout the industry. We also have models that come without tooling if you want to install your package. For extra freedom, check out remote machines that can be used while you move, enabling you to switch between working up close for precision or using a pendant control station for longer tubing jobs. 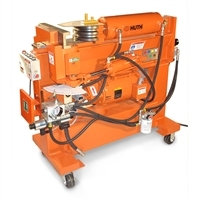 All of our machines are top of the line and highly durable, ensuring they will perform under heavy use for years to come. We have hand selected the best of the best in the industry, so you can get the quality machines you need without worry.